East Hanover, NJ – August 3, 2018. 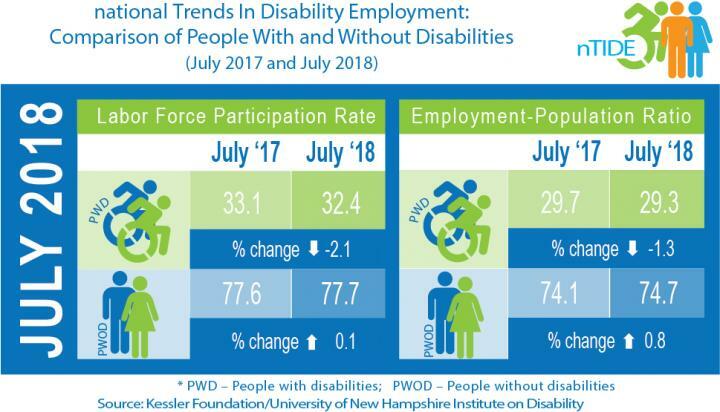 Job numbers declined again for Americans with Disabilities last month, according to today's National Trends in Disability Employment – Monthly Update (nTIDE), issued by Kessler Foundation and the University of New Hampshire's Institute on Disability (UNH-IOD). Despite the second month of downturns, experts remain optimistic about future job gains as the labor market continues to tighten. In the Bureau of Labor Statistics (BLS) Jobs Report released Friday, August 3, the employment-to-population ratio for working-age people with disabilities decreased from 29.7 percent in July 2017 to 29.3 percent in July 2018 (-0.4 percentage points; down 1.3 percent). For working-age people without disabilities, the employment-to-population ratio increased from 74.1 percent in July 2017 to 74.7 percent in July 2018 (+0.6 percentage points; up 0.8 percent). The employment-to-population ratio, a key indicator, reflects the percentage of people who are working relative to the total population (the number of people working divided by the number of people in the total population multiplied by 100). "From February 2016 until May 2018, we saw steady improvement in the employment situation for people with disabilities. However, for the past two months, we have seen slight declines in their employment-to-population ratio and labor force participation rate," according to John O'Neill, PhD, director of employment and disability research at Kessler Foundation. "This downturn is disappointing, but given the tight labor market, we may yet see further improvement for Americans with disabilities." In addition, the labor force participation rate for working-age people with disabilities decreased from 33.1 percent in July 2017 to 32.4 percent in July 2018 (-0.7 percentage points, down 2.1 percent). For working-age people without disabilities, the labor force participation rate also increased from 77.6 percent in July 2017 to 77.7 percent in July 2018 (+0.1 percentage points; up 0.1 percent). The labor force participation rate is the percentage of the population that is working or actively looking for work. "It is certainly disappointing to see the labor force participation rate of people with disabilities declining, compared to the same time last year, especially since the economy has been doing so well," said Andrew Houtenville, PhD, associate professor of economics at UNH and research director of the Institute on Disability. "Of course, two months do not imply a trend, so we will be watching this closely in the coming months." According to the Kessler Foundation National Employment and Disability Survey: Supervisor Perspectives, 66 percent of employers have implemented a process to provide requested accommodations. Of the 3,000 supervisors surveyed, 96 percent found these processes effective, according to Dr. O'Neill, a survey co-author. "The 34 percent of employers who lack an accommodations process clearly have an opportunity to improve their hiring and retention of people with disabilities by implementing a process for requesting accommodations," he noted. The majority of supervisors (96 percent) also responded favorably to having access to a centralized accommodations fund to help them provide requested accommodations. Only a small percentage of employers – 16 percent – have such funds, however. "This highlights another opportunity for the majority of employers," Dr. O'Neill emphasized. "Setting up such a fund would facilitate the provision of accommodations, and help supervisors keep employees in their jobs." Each nTIDE release is followed by a noon nTIDE Lunch & Learn. This live broadcast, hosted via Zoom Webinar, offers attendees Q&A on the latest nTIDE findings, provides news and updates from the field, as well as invited panelists to discuss current disability-related findings and events. For the August 3 Lunch & Learn, Katie Morrison, MPP, from Mathematica Policy Research joins Dr. Houtenville, Dr. O'Neill, and Denise Rozell, policy strategist at AUCD, to discuss employers' perspectives on accommodating and retaining employees with newly acquired disabilities. You may join live, or watch the recordings at: http://www.ResearchonDisability.org/nTIDE. Video recordings are also posted on YouTube by the University of New Hampshire.